Knowing how your pet will react before, during and after a storm is the first step in ensuring their safety. Our furry friends are more to us than just pets, and for many of you, they are a precious family member. Caring for them during a disaster is extremely important. You need to know that when an unexpected storm occurs, many of our animals face anxiety just as we do. Knowing how your pet will react before, during and after a storm is the first step in ensuring their safety. Making sure that you anticipate your pet’s needs during an emergency because it will help them cope with this disruption into their daily routines. Also, have a pet survival kit and a pet first aid kit set aside for your pet, as this too ensures their safety. Current vaccination and medical records for each animal (contact your veterinarian). 2 weeks worth of medication for each animal (if applicable). Note: Pay attention to the expiration date and routinely rotate medicines to ensure they are not wasted. 1. Decide if your pet(s) will be going to an animal hotel, sheltering in-place with the family, or staying at another home. Make arrangments before the disaster is imminent. e. Additional supplies required for where the pet will stay. 3. Ensure that your pet’s vaccinations are up to date. Note: If pets do not have their shots up to date, then pet hotels will not accept them. 4. Get a rescue alert sticker. It will alert rescue workers that a pet is inside the home. When displaying this sticker, ensure that it is placed in an area that is visible to rescue workers. 5. Verify that ID tags are up to date and securely fastened to your pet’s collar. Attach the address and/or phone number of your evacuation site (if possible). Note: If your pet gets lost, his tag is his ticket home. Make sure you have a current photo of your pet for identification purposes to include in with your family emergency photos. Ensure you have a secure pet carrier, leash or harness for your pet so that if he panics, he can’t escape. 6. Have a current photo of your pet to include with your family emergency photos. 7. Be sure to have a pet carrier, leash, or harness, if you pet is prone to panicking. Thank you for thinking of the animals. 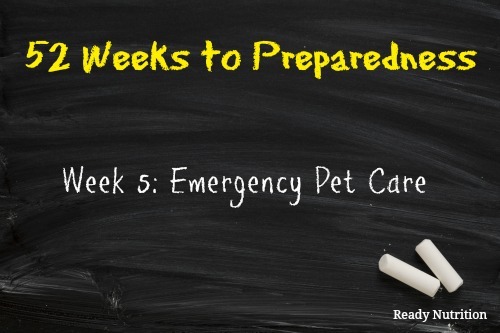 I have a cat and a dog that are just as precious to me as any member of my family, and I want to be prepared for them in case of an emergency also. I have 4 dogs, two are inside little yappers, but the best watch dogs of the four. I also have a mini stud horse who is my pet soul mate. I am trying to teach him to wear a pack, so that if for some reason we have to leave our home on foot, he will be able to handle packs of food etc. For food he can graze on what ever is around, but will still have him a bag of grain, so not to worried about food for him. He can also carry my tools I use to trim his feet. If someone gets hurt he can pull a litter. Larger dogs can carry things as well, just make sure to have the pack sized for them. When society collapses, and there is no easy food around, your pet will be food. I will also be getting muzzles for my two dogs. You never know how your dogs will react in a stressful situation and if there are a lot of unknown animals around. Have your pets (and even livestock) tattooed so you can prove an animal belongs to you if it is lost or stolen. Your initials or surname can be sufficient, or the animal’s registered name if it’s one of those “Sunnyvale Olallieberry Clair de Lune” type names and you have the animal’s registration paper from preSHTF with your name as owner. Tags can always be removed, or simply be lost if the collar comes off. The inside of the ear is popular for tattoos, but ears can be cut off – the inside of the thigh where the fur is thinnest works well. It is far more humane than branding, especially if the pet is very mildly sedated (more against the scary noise of the machine than against pain) and a topical anesthetic is applied before the tattoo is done. Many vets have tattoo equipment and will do an ID tattoo at no additional charge while an animal is anesthetized for another purpose. For now, please microchip your pets and most important livestock! It does not cost very much – humane societies and pet supply stores often do chips at the rabies-shot fairs where it can cost as little as $20, and many vets will knock it down to the cost of the chip for additional animals if you have several done at once – it does not hurt the animal, and it cannot be used for any kind of “tracking” as it is simply a passive identifier. The identification number can be reassigned to a new owner if the animal is sold or rehomed. As things stand now, chips are the best chance your pet has for getting back to you. Even indoor-only pets can get out, as I have learned to my sorrow.